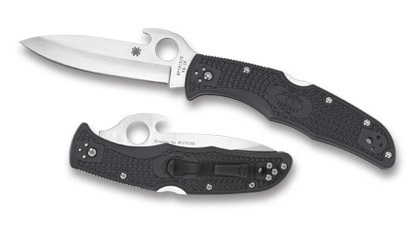 The Spyderco Endura Waved combine all that?s functional and performance-based in a Spyderco folder with the Wave Blade-Opening feature made popular and patented by Ernest Emerson of Emerson Knives. The Wave is a hook curving out the top of the knife?s blade. When removing the knife from a front pocket the Wave catches the pocket?s edge quickly opening the knife blade ready to use. 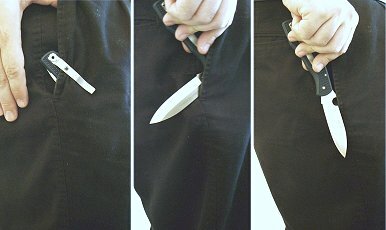 The knife can also be taken out of the pocket without engaging the Wave Opening Feature by pulling it straight up and out with your fingers on top of the closed blade. Waved Delicas and Enduras have screw construction making cleaning and adjusting easier. Their gray fiberglass reinforced nylon handles are molded with Bi-Directional Texturing® for traction and improved ergonomics. Inside the handle dual skeletonized stainless steel liners strengthen the knife without additional weight and create an anchor for external and internal components to attach through for more sturdiness and rigidity. Their VG-10 blades are flat saber-ground with a stronger tip and larger 13mm opening hole. Added to the blade's spine is slip resistant jimping. Phosphor bronze washers smooth out the open/close action and the clip is upgraded to a four-way tip-up, tip-down, left- or right-handed clip.